Malaysia Airlines (MAS) formally joined oneworld on 1-Feb-2013, giving the alliance 12 full members and its first member in Southeast Asia. For oneworld, MAS fills a white spot in one of the world’s fastest growing regions. 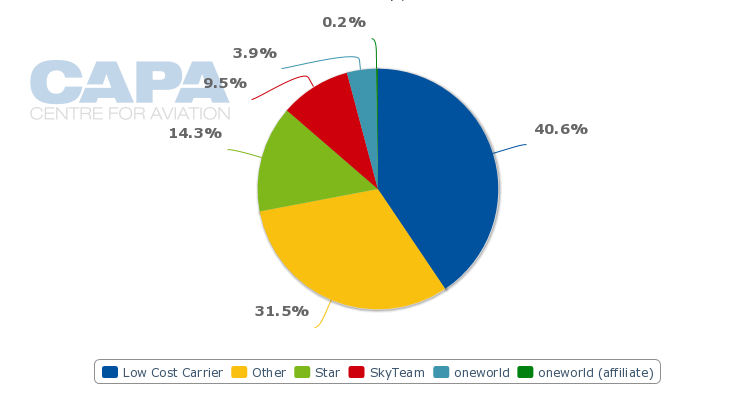 For MAS, oneworld supports the carrier’s new focus on the premium end of the market. MAS is in the latter stages of a restructuring which began at the end of 2011, when it unveiled a new business plan. Joining oneworld is a key component of the business plan. While only three oneworld members currently serve MAS’ Kuala Lumpur hub, joining the alliance expands its virtual network and increases its relevance in the premium market. Under its new business plan MAS is improving its premium product and also targeting higher yielding economy passengers. Over the last several years the carrier has lost premium passengers and corporate accounts to aggressive rivals in Asia and the Gulf. MAS is now trying to woo these passengers back and sees membership in a global alliance as helping that effort. While MAS has cut back long-haul capacity as part of its restructuring, dropping in early 2012 seven long-haul destinations, it has been adding regional international capacity over the last year. It is MAS’ strong regional network that adds value to oneworld, which previously had a weak position in the Southeast Asian market. 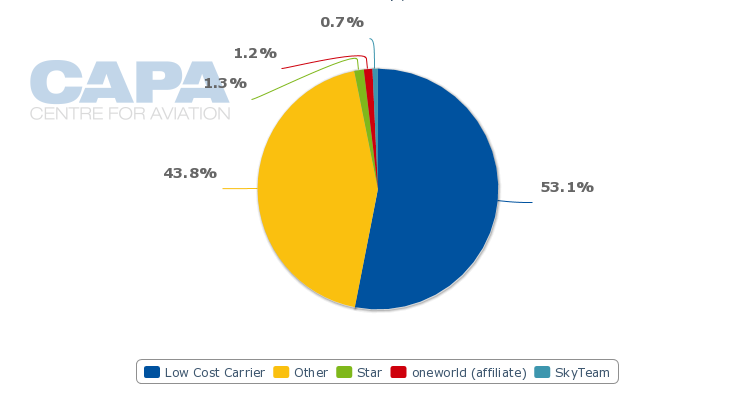 Star, which has two Southeast Asian members in Singapore Airlines and Thai Airways, currently has about a 14% share of capacity in Southeast Asia while SkyTeam, which has Vietnam Airlines as a member, has just under 10%. 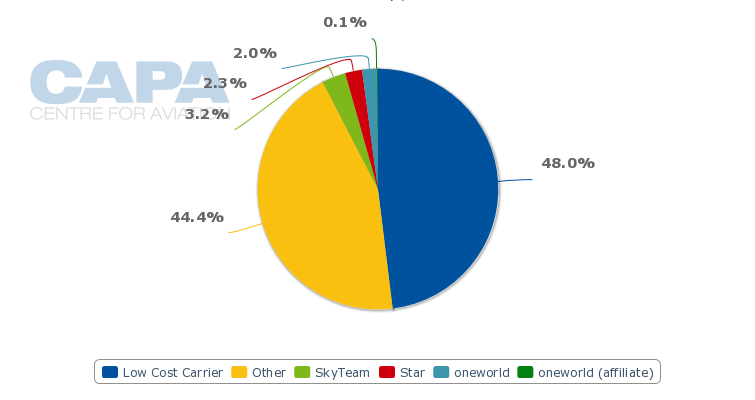 Oneworld had only a 4% share of capacity in Southeast Asia but with the addition of MAS this jumps to just over 10%, putting it just a few fractions of one percentage point ahead of SkyTeam. SkyTeam is poised to take over the leading position in Southeast Asia in 2014, when Garuda Indonesia is slated to formally join the alliance. 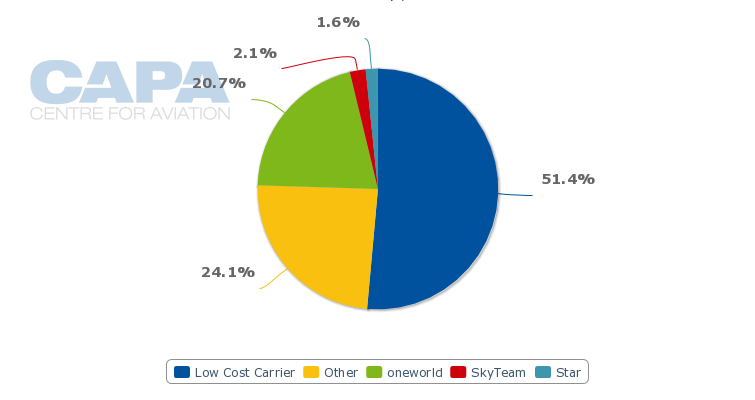 SkyTeam will see its share of capacity in Southeast Asia exceed 15% in 2014 while Star will have slightly less than 15% and oneworld will reach 11%. This factors in all new pending alliance members including Garuda for SkyTeam, SriLankan Airlines and Qatar Airways for oneworld and EVA Air for Star. While there will again be a gap in Southeast Asia between oneworld and its rivals, it is significantly less than the current gap and it is a position oneworld is comfortable with. Having an 11% share of the Southeast Asian market should be sufficient, particularly given MAS’ strong regional network. As a result oneworld does not see a need to add a second Southeast Asian member. The rest of the Southeast Asia market primarily consists of low-cost carriers, which generally would not be candidates for alliance memberships. Mr Ashby says oneworld is open to considering LCCs as members but only if they deliver to the customer and invest in improving their products as much as the existing members such as MAS. Outside of LCCs, there are limited opportunities for further alliance expansion in Southeast Asia. After Garuda, Philippine Airlines (PAL) is the only remaining unaligned Southeast Asian flag carrier of a significant size. PAL could potentially become an alliance candidate but the carrier first needs to complete current efforts to renew its fleet, improve its product and expand its network. 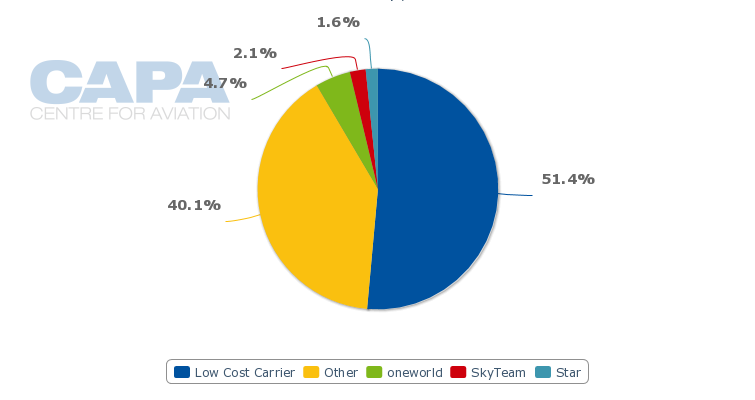 The other four remaining non-aligned flag carriers are all very small and would generally not add value to the global alliances although Cambodia Angkor Air would theoretically be a possible candidate for SkyTeam membership because it is partially owned and managed by Vietnam Airlines. LCCs currently account for 41% of capacity in the Southeast Asian market and have an over 50% share of the intra-Southeast Asia market. While LCCs have seen their share of the within Southeast Asia market steadily grow from virtually zero a decade ago, there is still room in this market for full-service carriers. MAS, which is the only major airline group in Southeast Asia that has not established a budget airline subsidiary or affiliate, remains committed to providing a premium short-haul product. This fits well with oneworld’s premium focus and ensures the alliance’s long-haul passengers have a premium product when flying around the region. MAS currently has more regional international capacity in Southeast Asia than any other full-service carrier except Singapore Airlines, which is only about 15% larger. MAS has about 10% more seat capacity in the regional international market than Thai Airways and is significantly larger than Garuda and Vietnam Airlines, both of which are more focused on their domestic markets. MAS has nearly twice as many international seats in Southeast Asia than Vietnam Airlines, about three times as much than Garuda and almost four times as much as PAL. About 40% of MAS’ international seat capacity is now allocated to the Southeast Asian market, according to Innovata data. MAS also has a large domestic network, which accounts for nearly half of the carrier’s seat capacity. Of the 16 destinations MAS adds to the oneworld network, 15 are in Malaysia. The other is the neighboring city-state of Brunei. oneworld’s share surged to 36% as MAS formally joined the alliance. About 61% of the Malaysian market remains unaligned and at least half of the market will almost certainly stay unaligned for the foreseeable future as LCCs account for a 44% share of the market, with nearly all this in the hands of Malaysia-based LCC group AirAsia. Malaysia is currently served by eight LCC brands, but the other seven have relatively small operations in Malaysia – Tiger, Jetstar, Lion, Cebu Pacific, Zest, Eastar Jet and Air India Express. SkyTeam until now has been the biggest alliance in the Malaysian market with eight carriers providing about 46,000 seats. Six of these carriers are from Asia – Taiwan’s China Airlines (CAL), China Eastern, China Southern, Korean Air (KAL), Vietnam Airlines and Xiamen Airlines. The other two are KLM and Saudia. Star has six members serving Malaysia and providing about 33,000 weekly seats – Asiana , EgyptAir, Ethiopian Airways, Lufthansa, Singapore Airlines and Thai Airways. Prior to MAS joining, oneworld had just four members serving Malaysia (including associate and full members), providing only about 30,000 weekly seats – Cathay Pacific, Dragonair, Japan Airlines (JAL) and Royal Jordanian. Cathay is by far the biggest of the oneworld carriers in Malaysia, operating four daily flights from Hong Kong to Kuala Lumpur and one daily flights from Hong Kong to Penang in western Malaysia. Its regional subsidiary Dragonair, which is an associate member, links Hong Kong with Kota Kinabalu in eastern Malaysia. JAL currently only serves Kuala Lumpur with one daily flight from Tokyo while Royal Jordanian has three weekly flights on a Amman-Bangkok-Kuala Lumpur routing. SriLankan Airlines would become the fifth oneworld member (excluding MAS) to serve Malaysia after it formally enters oneworld, which is expected in 4Q2013. SriLankan currently serves Kuala Lumpur with two daily flights but CEO Kapila Chandrasena says the carrier is looking at adding capacity to Kuala Lumpur to fill the void left by AirAsia, which is dropping its daily Kuala Lumpur-Colombo service on 26-Feb-2013. Mr Chandrasena tells CAPA that there could also be opportunities to support more Kuala Lumpur-Colombo capacity once SriLankan formally enters oneworld. Another pending oneworld member, Qatar Airways, is the third largest foreign full-service carrier in Kuala Lumpur after Cathay Pacific and Emirates. Qatar currently operates three daily flights between Doha and Kuala Lumpur with one of the flights continuing onto Phuket in Thailand. MAS already codeshares with Qatar Airways as well as with SriLankan. MAS also serves Colombo. But the number of oneworld hubs in its online network is rather limited, which limits the potential benefits it can derive from membership. MAS currently serves only a handful of oneworld hubs including Hong Kong (Cathay/Dragonair), London Heathrow (British Airways), Sydney (Qantas) and Tokyo (JAL). At least for now, MAS only codeshares with four current oneworld members – Cathay Pacific, JAL, Royal Jordanian and Finnair. The partnerhips with Cathay, JAL and Royal Jordanian are longstanding although not comprehensive while the deal with Finnair was implemented recently. MAS plans to start discussing potential codeshares with other members now that it has implemented frequent flier links with other oneworld members, a requirement for membership. In the meantime it will have access to oneworld interline rates. MAS is hopeful that more oneworld carriers will be enticed to launch services to Kuala Lumpur now that it has joined. Services from European members of oneworld are likely as they would be attracted to using MAS’ strong regional network to serve the entire Southeast Asia region. British Airways and Finnair are the most likely oneworld members to hook up with MAS in Kuala Lumpur as these two carriers are more Asian-focused than the other three European members - Spain’s Iberia, Germany’s Air Berlin and Russia’s S7. IAG director of strategy Robert Boyle tells CAPA that British Airways is looking at resuming service to Kuala Lumpur, which was served by BA several years ago. Codeshare talks between BA and MAS have not started but the two carriers expect to discuss cooperating on the Kuala Lumpur-London route as well to regional destinations in Asia and points beyond Heathrow. London is MAS’ third largest international destination after Singapore and Jakarta. The carrier now has almost 14,000 weekly seats in the London market, after having upgraded both of its two daily frequencies in recent months to the A380. Mr Boyle acknowledges BA will need to look at the market closely to see if there is room for a BA service on the Kuala Lumpur-London route given the recent increase in capacity from MAS. Europe currently only accounts for 11% of MAS' international seat capacity. MAS now only serves five destinations in Europe (London, Paris, Frankfurt, Amsterdam and Istanbul), giving it a significantly smaller network in Europe than Star members SIA and Thai Airways. This makes its membership in oneworld even more important as MAS looks to use the alliance to virtually expand its network in Europe as well as in the Americas, where it currently only has one destination (Los Angeles which is served via Tokyo). MAS was attracted to the prospect of working with Qantas, which is sponsoring its entry into oneworld, and combining the strengths of MAS and Qantas in the Asia-Pacific market. But MAS was not happy with the proposed commercial terms, which had MAS providing essentially all the assets including the A330s and all the traffic rights. MAS did not see Orca as a fair 50-50 joint venture as Qantas was only willing to provide its intellectual property. MAS was also concerned that Qantas would end up controlling the new venture, something the carrier’s shareholders – primarily the Malaysian government – would have never agreed to, particularly as MAS was putting in more than Qantas. Qantas subsequently entered into a partnership with Emirates, MAS’ biggest competitor and the largest foreign carrier serving Kuala Lumpur. Emirates currently operates three to four flights per day from Dubai to Kuala Lumpur, including one daily flight with the A380. Emirates operates a daily flight from Kuala Lumpur to Melbourne in Australia which will likely be included in the new partnership with Qantas. MAS will also have to compete against the new Emirates-Qantas partnership on the kangaroo route between Australia and Europe. MAS is a large carrier in Australia, where it serves five destinations. About 14% of the carrier’s international seat capacity is now allocated to the Australia and New Zealand market. But the carrier will have to continue serving Australia without a local codeshare partner as MAS has no plans to resume talks with Qantas now that Qantas is partnered with Emirates. The souring of the Qantas-MAS relationship just as Qantas served as MAS’ mentor in the membership ascension process creates an almost awkward situation within oneworld. With Qatar Airways now in the process of joining oneworld, more areas of potential conflict will crop up but Mr Ashby is adamant that it is best to give its members the flexibility to work with carriers outside oneworld as they see fit. Mr Ashby says trying to force members not to work with carriers outside oneworld would be “a failing proposition” and “a mistake”. He points out that “oneworld doesn’t go everywhere and all our members have relationships to fill the gaps”. MAS CEO Ahmad Jauhari Yahya sees oneworld as an ideal fit for MAS as the carrier continues to implement its new premium-focused business plan. He says MAS and other oneworld members are “like minded” as they share a focus on premium services. Mr Yahya pointed out that MAS is now “aggressively re-fleeting” as part of its business plan and improving its product at all customer touch points, which fits in well with the overall oneworld proposition. He added that “the time is clearly right for MAS to join one of the major alliance groups” and oneworld helps put the carrier “firmly on the global stage”. Mr Yahya is confident other oneworld carriers will start serving Malaysia but points this is a decision up to each individual member. He also believes oneworld members may be attracted to MAS’ secondary hubs in Penang and Kota Kinabalu. Cathay is the only other oneworld carrier currently serving Penang while its subsidiary Dragonair is the only oneworld member serving Kota Kinabalu. 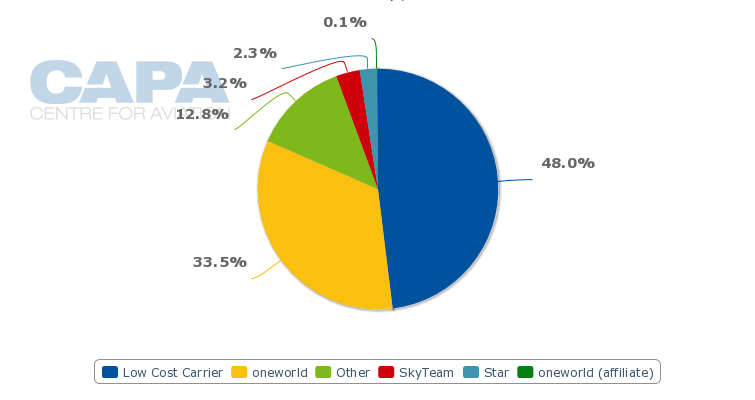 Oneworld now accounts for 40% of capacity at Kota Kinabalu, compared to only 1% prior to MAS entering the alliance. In Penang oneworld has seen its share of capacity increase from 5% to 21% (see background information). 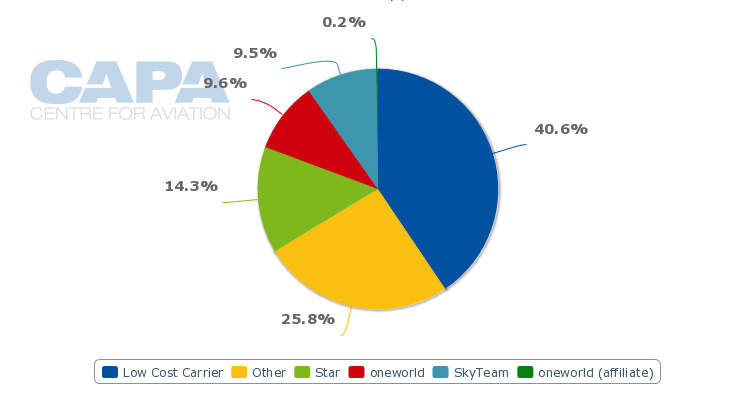 At Malaysia’s main gateway, Kuala Lumpur, the change in alliance share brought on by MAS joining oneworld is similar to the overall Malaysia figures, with oneworld now having a 35% share compared to 4% previously. MAS joining oneworld is a significant achievement and marks the beginning of an important new chapter for the long-struggling flag carrier as it attempts to chart a sustainable future. The premium market is intensely competitive and MAS has the most successful premium carrier in Southeast Asia, if not the world, at its doorstep in Singapore Airlines. oneworld should help MAS raise its game but it will need a lot more than just a global alliance to become profitable.